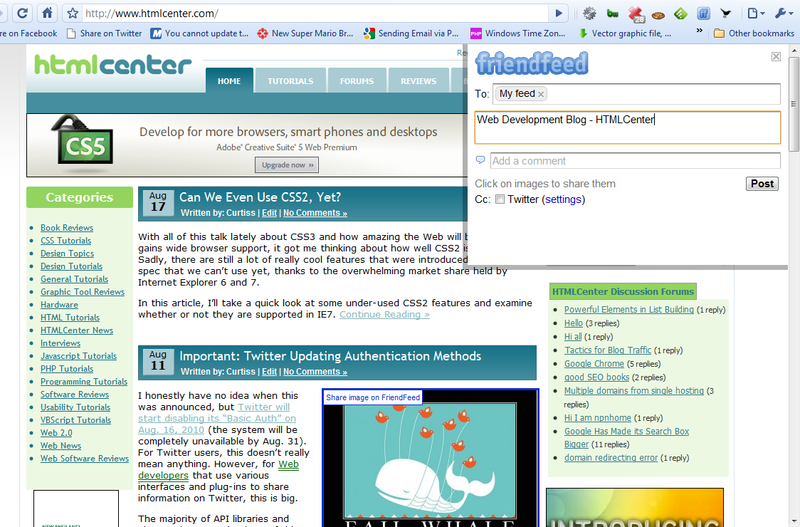 The Friendfeed bookmarklet includes two great features that I really wish the new Twitter bookmarklet included. The Friendfeed bookmarklet opens in a modal-type window directly overtop of the page you’re currently viewing. Basically, it injects itself into the page, making it easy to use. Unfortunately, the Twitter bookmarklet opens in an all-new pop-up window. The Friendfeed bookmarklet allows you to easily share images/pictures found on the page you’re sharing. All you have to do is click on the image and it is automatically uploaded to Friendfeed’s server when you share the page. Unfortunately, Twitter’s bookmarklet offers no such option. I’ve included a screen shot of the Friendfeed bookmarklet in action (actually, in this particular case, I’m using a Chrome extension that acts as a wrapper for the FF bookmarklet, but it functions exactly the same way). As you can see, it becomes part of the active window, as mentioned above. It doesn’t open in a new window. You can also see that one of the images on the page (my cursor was placed over the image, but my cursor wasn’t captured in the screen shot) has a thick blue border around it and includes a tooltip that says “Share this image on Friendfeed”. Are you aware of any Twitter bookmarklets that have these features? Any thoughts on why the official Twitter bookmarklet doesn’t? 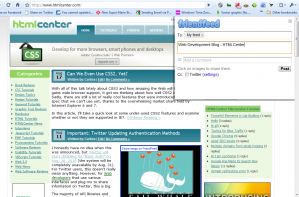 Will you be using the new Twitter bookmarklet?